hans w. koch (b. 1962) is a Cologne-based composer, performer, and sound artist. His work encompasses pieces for chamber and large orchestra, experimental scores for instruments, computers and everyday objects, sound installations, electronic music, etc. He summarizes his art as being about sculpting thoughts in diverse material and prefers conceptual approaches: “more thought, less material”. koch studied composition with Johannes Fritsch and currently is professor for sound at the Academy of Media Arts Cologne. Since the 1980s, koch has been concerning himself with the concept of “total harmony” (harmonie totale) introduced by Russian composer Nikolai Obouhow (1892–1954) where all twelve tones of the Western tonal system – in different octave ranges – are stacked into chord complexes, thus articulating the idea of a vertical twelve-tone music, as opposed to the horizontal twelve-tone music after Schönberg. Less than the mystical connotations expressed by Obouhow, koch is interested in the conceptual potential of this approach: a self-contained harmonic system in which every chord is an inversion of every other. 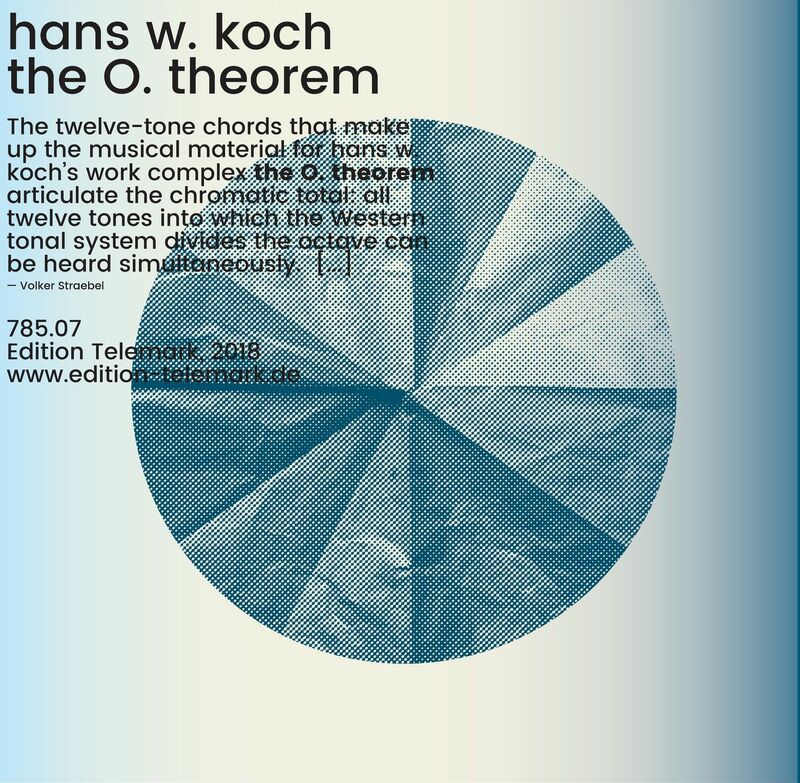 koch has made several works relating to total harmony and calls this work group “the O. theorem”. This LP presents two pieces within this group: “stele fuer n.o.” for large orchestra (2010) was premiered at the festival MaerzMusik in Berlin in 2010 with the Konzerthausorchester Berlin. “clock of fifths [totensonntag]” (2017) is an electronic piece where a field recording of church bells is filtered through a smartphone app developed by koch: The microphone signal is divided into twelve tone pitches that are heard in accordance with a timer that moves through the circle of fifths shown on the smartphone display. Edition of 300 in full-color sleeve. Printed inner sleeve with liner notes by Volker Straebel and hans w. koch.